Mark returned my call shortly after I had left a message with his answering service. He was pleasant and helpful, and was able to schedule us the following week. He showed up on time but was all alone, so I was worried at first that that would mean it would take a long time to get the job done. He assured me it would take no more than 2 hours, even with the dirty areas, and he was right on target. 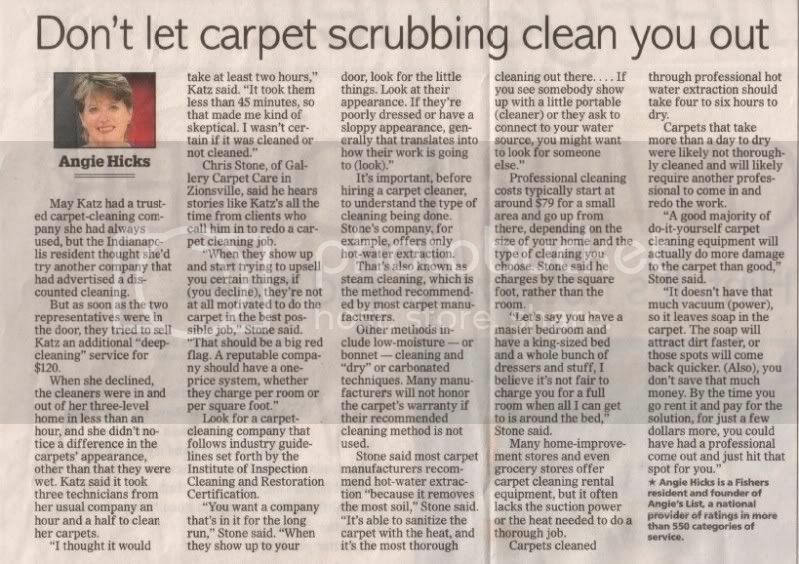 BOTTOM LINE: The carpet came out so clean I could hardly believe it! In less than an hour after he left, the carpets were about 90% dry, and were completely dry within 2 hours. There was no odor while he was cleaning or afterwards. He left us a small bottle of cleaner for spot cleaning. I feel I got more than my money's worth. The results exceeded expectations." "Mark showed up at my house at exactly the time he said he would. He was very professional. At first, however, I was somewhat skeptical about my decision to hire this company. I had expected a big truck, hoses coming in the front door, a crew of 2 or more, etc. Mark assured me that if I didn't like the results of the job, we would talk and negotiate the price. I left for work. I returned home later in the day to find beautiful, clean, spotless carpets in my living room, 2 bedrooms, a hall, and a flight of stairs. Mark had quickly made a believer out of me. THE RESULTS WERE GREAT! Stains removed; no smell; no drying. My carpets have never looked better. I will use this company again without hesitation. GREAT JOB!" So, see if you can get your customers to "go public" with comments on the results you obtained for them. That's the best way to grow a business. Shes just regurgatating all the info the HWE guy told her .